Looking for useful and fabulous favors that make the most of a hot trend AND give you the opportunity to make them one-of-a-kind mementos of your day? Well, the stemless glassware trend is red hot right now and with Fashioncraft's Silkscreened Glassware Collection you choose a design that's yours and yours alone! So, these favors are just right for memory-filled toasts on your big day and long after. Really happy with my purchase. 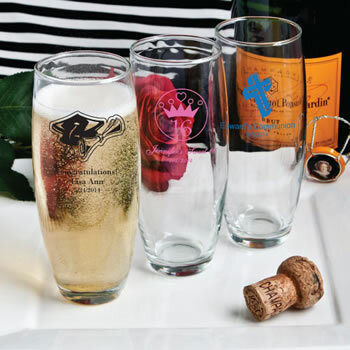 These glasses are perfect for a wedding champagne toast. My order was completed and delivered in 7 days! My daughter loved the flutes, she’s excited to give them out to her friends during her sweet sixteen party in June. Prices and products are great... The shipping cost is too expensive considering most companies after spending $150 or more is free. From NicePriceFavors: We are happy to hear that you liked the flutes. Regarding the shipping cost - I think you will find that our total prices (merchandise/setup costs/freight) are lower than most companies. Companies who are giving free freight are generally adding the cost to the price of the item. So when you compare the total cost you will likely find that NicePriceFavors is the least expensive! The items arrived safely, TIMELY, and as expected. A real value! As favors, they were well received!!! Everything was great! The design, color, and cup were all as expected. Cup was great quality! I said I needed them by 8/16 and I got them on 8/16! Would recommend and order from again! Very nice item and excellent customer service! The flutes were exactly as advertised and very pleased with the final result. I will shop here again for sure. The personalized flutes came out great , they served as take home gifts filled with candy , small pic frame,and swizzle stick. Wrapped in cellophane.They were wonderful. I scoured the web and determined this company had best to offer. I was not disappointed! The glasses were beautiful, good quality and all arrived unbroken. To top it off there was a last minute date concern and the glasses arrived in plenty of time. I will be ordering more for the wedding! These flute glasses were an absolute hit given out as favors. The quality was great and the price was perfect compared to other sites. The inscription was flawless, but thought it would be slightly larger. Would definitely order from them again. They were a hit at the bridal shower that I threw a few weeks ago! *Favor tip: If you fill the glasses with gold tulle, it looks like champagne is in the glass! I ordered the champagne flutes for a baby shower. I love how they look. I got the pink moon and stars with the babies name and the year. They arrived right when I was told they would and they look beautiful. I washed them in the dishwasher on the glass cycle and they came out fine,although I would hand wash from now on as I wouldn't want the decoration to wear off. Very happy with my purchase and would order from here again. We use these to serve mimosas at a baby shower, and they were a huge hit! We were very pleased! They are beautiful, sturdy, and BIG (the "extras" will be used at the reception as bud vases). I was very pleasantly surprised to get name brand glasses with clean & clear (though small) screen printing, especially at this price and speed ! We absolutely loved the glasses. The price was awesome, the quality was outstanding. They arrived when they said they would. Our bride and bridal shower guest really enjoyed the customized touch.